Combine maths, problem-solving, and a good bit of game-playing fun in this useful and entertaining app for developing mathematical fluency in five areas. Great graphics and sound add to the experience. Orcs, dragons, wizards and mummies are not typical of an educational game, but then genuinely fun gameplay isn’t either and this game has that too. 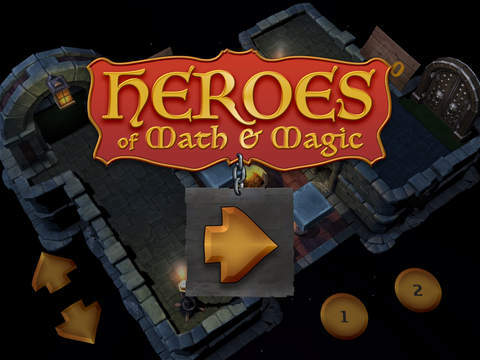 Heroes of Math and Magic, otherwise known as HoMaM, is a puzzle game that is built around maths. In essence, the task of each of the puzzle types is driven by maths, such as collecting a set of numbers to reach a sum, complete a sequence, build an equation, and more. The challenge comes from both doing the maths but also from completing the puzzle element. The puzzles take the form of choosing the correct route through a grid, reaching each of the needed numbers, before finally leaving through the exit. Each square on this grid can only be visited once before it plummets away. An unwisely chosen route will leave the player stranded and looking for the retry button. The well-chosen route weaves through the squares, collecting treasure and numbers in the correct order before finally making it home through the portal. This encourages an interesting bit of multitasking as the player must switch between his or her maths knowledge and the forward planning of a route. This is not a teaching app, but it is one that enables students to enjoy practising what they already know to increase their fluency and apply it in different ways. 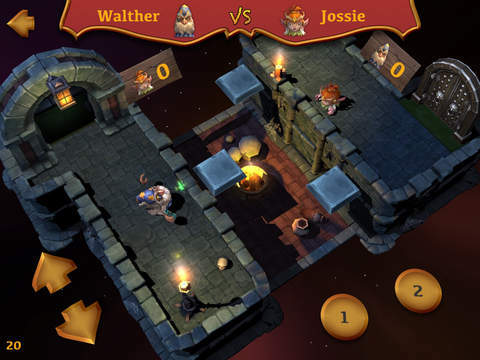 Once one of the main puzzle levels is completed, the player can choose to engage in a purely game-based duel involving transporting your minions over a chasm while an opponent does the same. 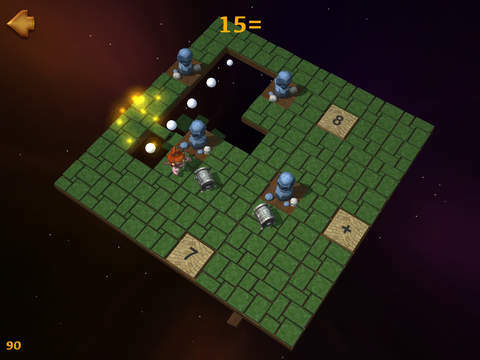 Its challenge comes from timing, adapting to the isometric controls, and quick reactions. It isn’t anything to do with maths, but it provides a fun interval and it is a definite challenge to do everything right. 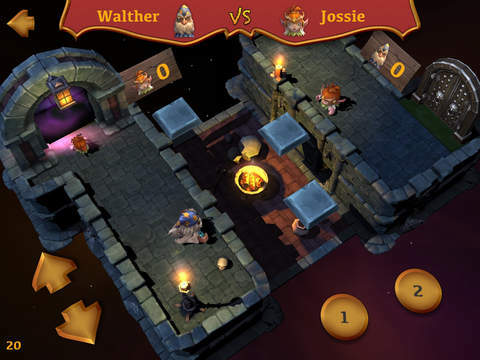 The app is enclosed within a beautifully rendered game environment of the sort more often seen in purely entertainment driven games. Cute and detailed characters wander through the 3D play area with excellent sound effects and soothing ambient birdsong and the like. Despite its clearly demanding graphics, it runs fine on the older iPad 2 although on this it very occasionally freezes on initial loading. Progress is rewarded by unlocking new characters and the familiar three-star system to rate the level of success at any one challenge. This is recorded and makes it an ideal game for a child’s personal use but less so for a class device. To be useful to a child in school, it would be nice to see an individual user profile or an easy way to play as a guest from scratch. Apps such as this, make a great alternative to tests, quizzes and worksheets to develop maths fluency. HoMaM does not cover a broad amount of the maths curriculum, but it has chosen five useful areas to focus on. At a very reasonable price for such a polished app, it is another useful tool in the parent’s toolbox to help their child in maths and, in a school with individual devices, it will also provide constructive fun. 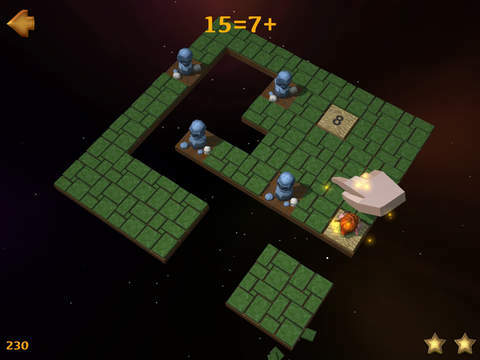 Solve fun math puzzles and fight other heroes for honour and glory.